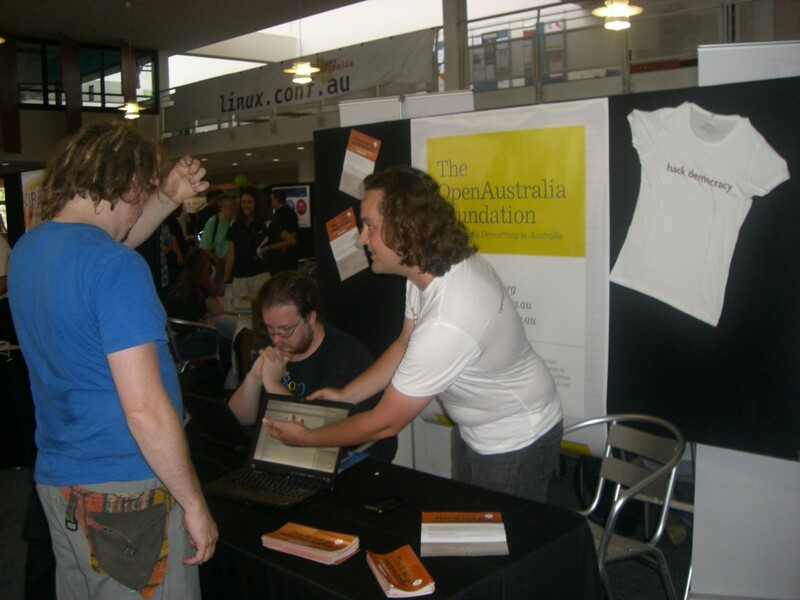 We were recently invited to host a stall at the linux.conf.au 2011 Open Day. linux.conf.au is one of the world’s premier free software conferences and is run each year by the community. Open Day is held on the Saturday after the conference and is open to the general public to learn about free and open source software. Tim ‘mithro’ Ansell and I attended the conference all week and had an excellent time learning lots and meeting interesting people. We volunteered to run the OpenAustralia stall yesterday the 29th of January and it turned out to be a great day. We got the chance to meet a whole host of people who had never heard of us and educate them about what we do and what our projects have to offer. It was interesting to find that some people had heard of one of our projects, really enjoyed using it, but were not aware that we run a variety of projects. We also gave away a bunch of OpenAustralia “Hack Democracy” t-shirts to grinning Open Day attendees. We’d like to congratulate all of the organisers and volunteers that made linux.conf.au such a success in 2011, against amazing odds. We’d especially like to thank Clinton Roy for heading up the organisation of Open Day and inviting the Foundation to host a stall. See you next year in Ballarat! This entry was posted in Announcement, OpenAustralia Foundation and tagged electionleaflets, free software, Linux, Linux.conf.au, openaustralia, planningalerts. Bookmark the permalink. Post a comment or leave a trackback: Trackback URL.